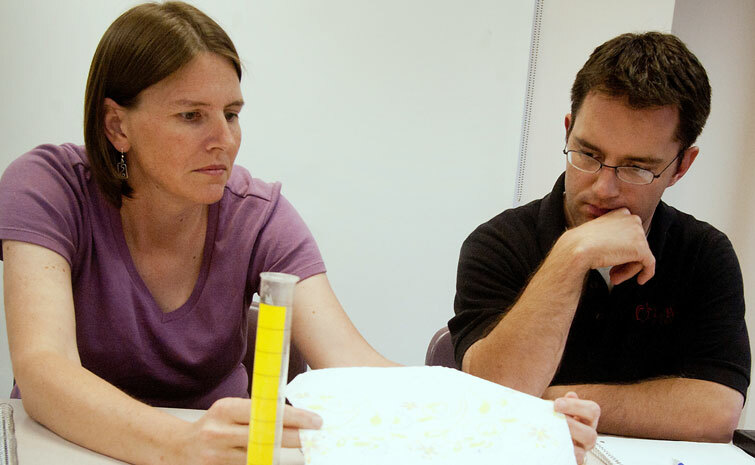 The Teacher Education Program is open to women and men college graduates who meet the standards established by the Meredith College Teacher Education Committee and the Department of Education. Initial licensure candidates must take a minimum of 30 hours of course work at Meredith, which may include courses in general education. Exceptions will be determined on an individual basis by the Department of Education. In addition to the satisfactory completion of course requirements, students must take the PRAXIS Core exams in Core Reading, Core Writing and Core Mathematics during the first semester of their enrollment, meeting the total score requirements. An official report of the scores must be furnished to the College, which may be accomplished by correctly coding the Critical information Form (found in the PRAXIS bulletin) for the particular test. The North Carolina Department of Public Instruction requires successful completion of the North Carolina General Curriculum with Mathematics Subtest and the Foundations for Reading for licensure in elementary education (K-6), and Praxis II for all content areas, excluding Dance and Theatre. Teacher candidates in elementary education (K-6) will register and complete the North Carolina General Curriculum and Mathematics subtest the semester before student teaching and Foundations of Reading in the last semester of their program. Students in all other tested licensure areas will take PRAXIS II in the last semester (or the semester before) of their program. Registration for the North Carolina General Curriculum and Mathematics subtest and Foundations of Reading can be found at http://www.nc.nesinc.com/; registration information for PRAXIS II testing can be found at http://www.ets.org. Complete this form and submit a copy (need not be certified) of your undergraduate transcript(s) to the Department of Education for evaluation. A check for $25 for each requested licensure area evaluation must accompany the forms and transcript(s). If you attended school overseas, you must have an official translation completed by World Education Services, Inc. (WES). After receiving the written evaluation, contact the Department of Education to schedule an appointment with an advisor. During your meeting, a planned program will be prepared and further information about admission will be furnished. During your first semester, order a certified copy of your transcript(s) to be sent directly to the Department of Education at Meredith College. Holders of current class A North Carolina licenses, who wish to add an area of licensure may do so through the Teacher Education Program at Meredith. PRAXIS I tests are not required, but the applicant must take the appropriate Specialty Area portion(s) of the PRAXIS II during the final semester. Student teaching will be required except when sufficient documentation of specific satisfactory experience is submitted to the Chair of the Department of Education for evaluation. Decisions will be made on an individual basis. Those interested in subsequent licensure should follow the procedure outlined for initial licensure candidates. In addition to the transcript(s) submitted, a copy of the applicant’s current teaching license should be included with the linked forms. Individuals who want to begin the licensure program in the fall semester should have their transcript evaluation completed and should meet with an advisor in the Department of Education prior to June 30. Those who want to begin the program in the spring semester should have their transcript evaluation completed and should meet with an advisor in the Department of Education prior to October 30.